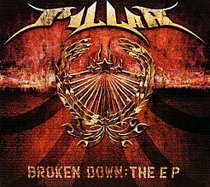 Pillar is comprised of Rob Beckley (vocals), Lester Estelle (drums), Noah Henson (guitar), and Kalel (bass). These Christian rockers with an alt-metal edge have been honing their infectious sound since 1998 while attending Ft. Hays State University in northwestern Kansas. A deal with Flicker was inked in 2000 after the band's self-released debut, Metamorphosis, impressed the label. Within months, Pillar followed things up with Above. Their first single, "Open Your Eyes," was popular on the college charts, earning Above nearly 60,000 in sales. Pillar also earned the Best Rock Band award at the annual Dove Awards in 2001. A year later, Pillar relocated to Tulsa, OK, and released Fireproof. MCA picked up the band and reissued the energetic sophomore effort in 2003. Where Do We Go from Here appeared in mid-2004, and The Reckoning followed two years later.